The China Conservation and Research Center for the Giant Panda, located at Bifengxia Panda Base, is engaged in reproduction research. They have become very effective in raising baby pandas to adulthood, and within fifteen years they hope to be able to reintroduce the pandas back to the wild. 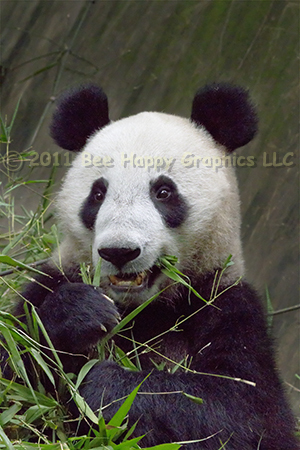 Although the giant panda still has the digestive system of a carnivore, 99% of its diet is bamboo. A 300-pound bear can eat twenty to thirty pounds of bamboo a day, which means they do indeed defecate in the woods - up to forty times each day. This is one of two photographs we have published from this research base that day. This panda is a mature adult. 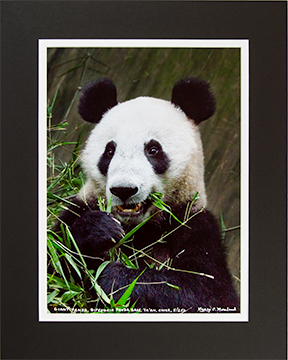 The other photograph, Giant Panda In Tree is of a two-year-old. For a little more information about that trip, check out “Red Panda” Added To Website. Photographic details: Canon EOS 7D camera w/ EF 100-400mm f/4.5-5.6L IS USM lens set at 235mm. Flash was not used. Camera was on f/11 (Aperture Priority) for 1/400 sec at ISO 6400. Fine Art Paper 15" x 11" 24" x 16"
Canvas N/A 39" x 26"
Copyright © 2017 Bee Happy Graphics LLC. All images and the design of this Web site are protected under federal copyright laws. 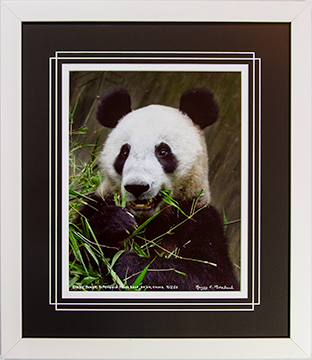 Purchase of any print shall in no way constitute a license for reproduction or any commercial use of the image. Any downloading, duplication or reproduction of any part of this Web site by any method whatsoever without the expressed written permission of Bee Happy Graphics LLC is strictly prohibited.